I take no advice on saddles anymore. Brooks. Yes, I may have cracks around the copper hand hammered rivets on one of mine, although it is most likely my fault not Brooks. But I have them on all my bikes. I really don’t regard others opinions on saddles of any use whatsoever. I have ridden great distances at speed and long hours on day after day trips, and I won’t ride anything else. It simply is wrong. I would have excluded my silly little Dahon folding bike which I got to join my partner’s folding bike in the rear of the Subaru or Westy on trips. But that silly little folding bike began to see more and more mileage and the stock saddle was always painful. Worse, on my first double digit ride, I developed a sore, and I ride enough that shouldn’t happen. On the same ride, riding behind my partner, I ovserved that she stood on the pedals from time to time to alleviate the suffering from her saddle. I have seen that before, and I vowed to never watch it on more than one day again. I would rather pay Brown to find me on the side of the road. New Brooks for both of us. A Black B17 Standard for me, and a Black B17 S Standard (the women’s version) for her. Even during the break-in period they have been more comfortable than the stock saddles. I would have said they were simply too high a price for this type of bike, destined to be ridden shorter distances, but from sores, to sore rears, the stock saddles made the bikes not nearly as rideable as they should be. 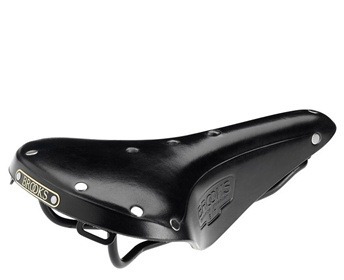 The Brooks make any talk of saddles disappear and bikes are extremely comfortable and ridden a great deal. MOTORCYCLES: I know someone who is outfitting his Motorcycle, a Honda CB750K with a Brooks, read about which Brooks he selected and why. The principle is the same though, nothing was ever engineered about those bike seats and they are rather hard to sit on, painful after less hours than he put on his Brooks each day riding across the country. So why not simply rip off the seat and weld on a seat post and install a Brooks. While it may appear less conventional, I imagine that he will put on a lot more miles in greater comfort than the old seat provided. Pictures provided when they become available. Until then, I will look at this one from the Brooks site.